We present here an unusual application of Baire category theorem between topology, group theory and dynamical systems. Roughly speaking, we prove that almost all pairs of homeomorphisms of the circle are unrelated; in particular, it leads to natural occurrences of free groups. Theorem: The set of pairs generating a free subgroup of rank two in is a dense in . Proof. With the distance given above, is a complete metric space, so Baire category theorem applies. has empty interior and its complement is a dense , completing the proof. denote the image of by the homeomorphism ; in particular, is closed set whose interior is empty if . Because is itself a closed set whose interior is empty, there exists such that for all words satisfying . First, notice that since and that if . Indeed, if it was not the case, there would exist a proper subword of fixing , while for some word , hence , a contradiction. To conclude, let and be two homeomorphisms arbitrarily close to and respectively, and satisfying but . Thus, because is open, but by construction, a contradiction. Then is a free group of basis . Let . If in , then . But , hence , hence , and so on; finally, . We deduce that , a contradiction. Therefore, in and is a free subgroup of basis . The first example of free subgroup of comes from the natural action of on the set of lines passing through the origin, that is on . 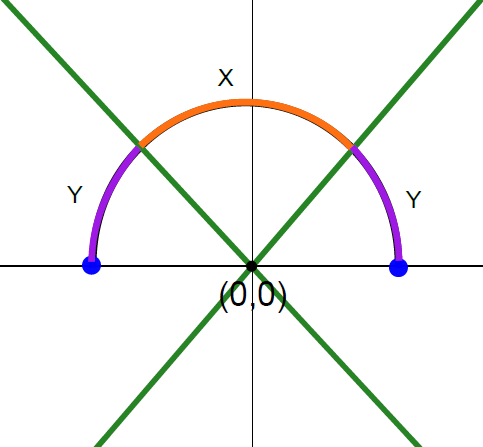 An explicit homeomorphism between and is illustrated by Figure 1, where the two blue points are identified. Now we wan to apply ping-pong lemma to and . 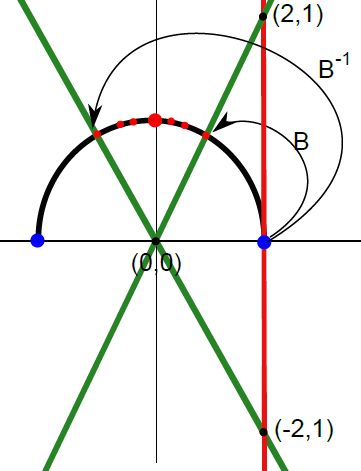 The actions of and on the circle are illustrated by Figures 2 and 3 respectively, through the previous homeomorphism. Therefore, is a free basis and generates a free subgroup of , and a fortiori of . Definition: Let be a homeomorphism satisfying for all . If there exists a sequence of reals satisfying and such that is affine on each , then the induced homeomorphism is said piecewise linear. 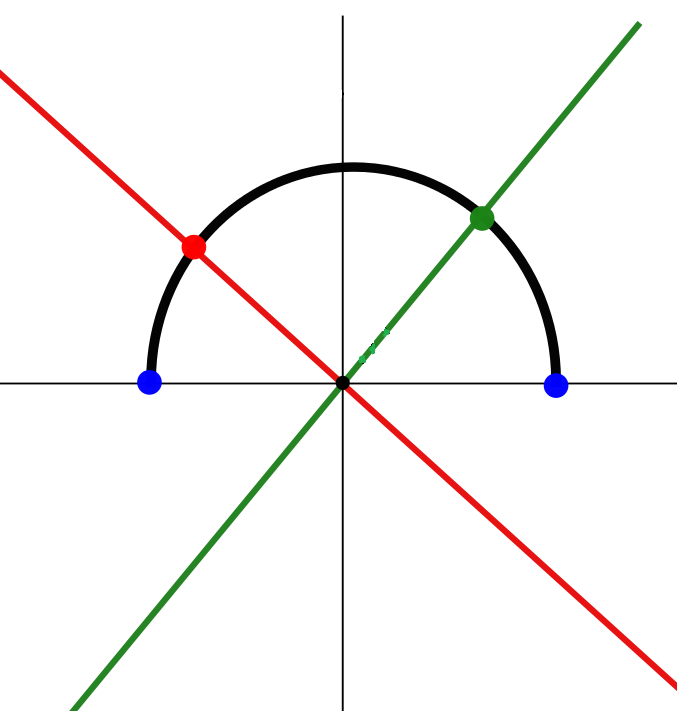 The set of piecewise linear homeomorphisms of the circle is denoted by . Therefore, ping-pong lemma applies, and is a free subgroup of rank two of the group . More information about the group of homeomorphisms of the circle can be found in Etienne Ghys’ document, Groups acting on the circle.